JPEG Saver 4.0 changed the way that transitions worked from just using the old DirectX 3 DirectDraw functions for page-flipping to using DirectX 9's Direct3D for hardware assisted geometry and pixel shader transitions. 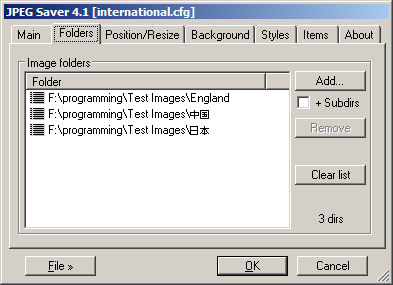 Most of the transitions that were available in JPEG Saver 3.6 were re-implemented using the new, faster techniques. JPEG Saver 5 rewrote the graphics code again, this time using DirectX 11. This means that the DirectX 9 libraries do not need to be installed or updated with JPEG Saver, and also provides support for displaying transitions on any machine that supports the WARP device. This should be anything using Windows 7 or later, where DirectX 11 is installed as part of the operating system. Changed to using a more robust method for messaging between threads. Fixed F10 save desktop option saving grey bitmap. Added buttons to the background and style editor dialogs for swapping colours over. Improved error handling throughout. Fixed crash when using shape skip and blank secondary monitors. Fixed Direct3D screen randomly not advancing images. Fixed images not advancing when secondary screens set to show previous image. Fixed filtering by tag using “!=” not excluding only those images that have the tag set. Fixed filter tree display not updating after filters edited. Updated screen mode code to make it fit better with DirectX 11. Replaced JasPer with OpenJPEG for loading JPEG-2000 images. Added stack and scattered transitions. Fixed “Finding images…” text not fading out when first image displayed. Improved animation timing for transitions. Graphics code rewritten from DirectX 9 to DirectX 11. Ended use of SCRNSAVE.LIB for basic screensaver functions. Added fall off and ring wipe transitions. JPEG Saver is now available in 32 or 64 bit versions. The installer has been changed to use Windows MSI files instead of self-executing. The style editor dialog is now resizeable. Added reset button to filters dialog to reload default set of presets. JPEG Saver now exits when the Direct3D device is lost. Added elapsed times to process info item formats. Added unfold push transition. Updated all random number code to use more modern functions. Fixed crash when using Desktop or Desktop Pile backgrounds. Fixed name and enabled state not being added with new items. Added white out and colour fade transitions. Fixed main image filename being forgotten, causing interactive options to misbehave. Fixed right-aligned DirectWrite text being cropped at right. Rewritten drawing code to use Direct2D and DirectWrite, falling back to using GDI when unavailable or disabled using new debug dialog. Fixed crash when attempting to use random item positions. Fixed crash when loading some Windows tags / keywords from images. Added filtering by tag (EXIF and IPTC keywords). Added wave push, funhouse, corner rotate and twist over transitions. Improved folder lock mode navigation. Removed Windows XP support - minimum supported Windows version is now Windows 7. Added filter preset support and some built-in presets. Added filtering by age of file. Added checkbox to enable/disable filters. Added count of transitions enabled to main dialog. Made main transitions selection checkbox toggle between all / none / previous selection. Fixed partial crash on some hardware when transitions were given incorrect timing. Fixed crash when using secondary screen as main JPEG Saver screen and no images on primary screen. Fixed random start option for Explorer slideshow mode. Fixed red/blue colour swapping on some display hardware. Added Windows Explorer integration for use as slideshow viewer. Improved display of style font details. Added image pile background modes. Added folder lock interactive option using the “a” key. Added circle, rings and cross flop transitions. Added analog clock item. Added Windows Explorer properties to file info item formats. Added warp spots transition. Added config file version test. Space bar now pauses and resumes in addition to the “p” key. Control key is ignored when not used my JPEG Saver's interactive options. Fixed bug preventing display of some IPTC fields. Fixed bug where background was not being drawn. Improved rating options to make them more robust and provide a better error message. Added alphanumeric image selection mode. Added image average and image edge average background modes. Tidied up options on folders tab, new folders are now always added in recursive mode. Added mirror X, mirror Y and desaturate options to background tab. Made background images centre on main image position. Improved loader thread code to prevent loading images for multiple screens in the wrong order. Added favourites support. Added transition speed option. Added shift, intersect, viewpoint, boxes, checker boxes and box turn transitions. Fixed colour management not working. Fixed change timer not restarting after transition aborted. Fixed crash when loading broken PNG images. Improved list info item. Fixed image loading stopping when same image picked twice in succession. Fixed images being rotated unnecessarily when embedded EXIF thumbnail has orientation data. Fixed config dialog being placed behind other windows after preview. Made file selection modes not pick the same image twice in succession. Added preview button to dialog. Added shutters transition. Added desktop wallpaper file location to interactive options dialog. Added scanburst option and made metadata scan less aggressive during input. Added maximum shape skip. Added sequential mode toggle from screen saver. Added two new transitions. Added F1 help to dialogs. Added width and height filters. Added background metadata scan. Fixed loading config file from non-boot drive. Fixed sub-folders being deleted from database when higher level folder modified. Added cursor keys only interactive option. Added two new transitions. Added renaming of items. Dialogs now open in centre of screen to avoid taskbar when not at bottom of screen. Re-added skipping of bad images. Fixed corrupt pixels appearing on some hardware. Improved multi-monitor support with options dialog. Added EXIF GPS fields to image details item. Added three new transitions. Added checkboxes to folders and items tabs to enable/disable selection. Images are now loaded and scaled in background threads to prevent screen locking up. Improved check for new images. Save desktop wallpaper option now saves multi-monitor images. Fixed bug where incorrect validation would prevent adding items. Fixed JPEG Saver process not always exiting when quit during a transition. Added loading of WebP images. Added “Keep aspect ratio” option for resizing background images. Made clicking on colour swatches open the colour selection dialog. Added alpha support to logo image items. Added four new transitions. Fixed random crashing during image loading. Fixed crash when deleting last style and items using it. Fixed filter editor not displaying previous value. Added style and piling options to text file item dialog. Added minidump option. Split up resizing options to allow scaling larger and smaller images differently. Added option to resize to a size in pixels instead of a percentage of the screen size. Added border edge options. Improved “Desktop”, “Pile” and “Desktop Pile” background modes. Added “Allow piling” option for showing items on piled backgrounds. Improved text handling for IPTC and Exif fields. Fixed several bugs in Exif and IPTC code that could cause crashes. Added: text file item; resampler class for more scaling options; left, centre and right align options for text items. Fixed pause icon still being shown when unpaused by pressing the next or previous button. Fixed loading of logo files with paths that were previously failing. First version compiled with Visual C++ 2010. Improved database error handling and on-screen display. Added shortcut creation and rating images, GIF and TIFF loading. File associations for the config files, a transition bug fix and some other config-related fixes. The file extension for config files is now “.jscfg”. More dialog updates, installer bug fix, two new transitions, several new command-line options and some other small improvements. Dialog improvements, three new transitions, bug fix in filter groups. Quick bugfix release - the ‘e’ key action was only working when there was a “Now Playing” item enabled. Adds image list filters, the ‘o’ and ‘e’ key actions, and fixes a couple of bugs. Bug fix - sequential mode would get out of sequence when new files were added to a folder. Also updated the installer to make files install as the right user. Added transition preview to dialog, plus another two transitions. A bugfix release - the image folder background mode was broken, probably since version 4.1, so this version fixes it. I also took the opportunity to add another transition and update the libraries that JPEG Saver uses. This minor update fixes a small bug in the clock item dialog, adds two new transitions and updates the install directory on 64-bit Windows. This version adds: colour management; more transitions; database updates; a few other minor fixes. Version 4.1 changes things a bit. Instead of using a cache file to speed up loading the list of images, the list is stored in an SQLite database. Details of the last image displayed are also stored in the database, so there is no jpegsaver.last file either. As well as this, version 4.1 allows the loading and saving of different config files - the current config file is shown in the dialog title bar. The other big change is that Unicode is supported in the dialog, in the folder and file names, and any text items shown by the screen saver. A quick bugfix release, with some updated libraries. Very little has changed in the final release version, but the installer has been improved to check if the required DirectX libraries are installed already. There were a couple of bugs in preview 3, one of which could cause JPEG Saver to crash, so I've replaced it with preview 3a. The “Explode” and “Implode” transitions had a memory allocation problem and the dimmer would cause the non-primary screen to go black under some circumstances. The full list of keys is now shown on the main JPEG Saver interactive controls page. This version uses DirectX 9 - so you must have DirectX 9 installed to use it! If your computer doesn't support DirectX 9, then this version of JPEG Saver is not for you. The JPEG Saver 4 installer comes with Microsoft's DirectX web installer, so you can install or update your version of DirectX from the installer. Alternatively, you can download the full installer or updates directly from the Microsoft Download Center. JPEG Saver 4 requires the main D3D and D3DX libraries. If you get an error message saying that d3dx9_39.dll (or something similar) could not be found or loaded, then that means that your DirectX 9 installation is not complete. Since Windows 7 the DirectX 11 has been a part of the operating system. Unfortunately JPEG Saver uses DirectX 9, which isn't installed by default. The JPEG Saver installer will attempt to install DirectX 9 for you, but if you get an error message about a missing DLL when you try to run JPEG Saver you might have to install it yourself - see the FileHippo link in the section above. I expect there are still bugs in this version - if you	find any, please let me know and I'll do my best to fix them. Before you tell me about missing transitions, please note that not all of the transitions from the 3.x version have been rewritten to work with the new rendering method; I expect I'll get around to them eventually. The latest version is available from the downloads page.